Ingrid brought us chocolates when she came to visit us last weekend - but not ordinary chocolates, Pierre Marcolini chocolates! (Note: the site uses Flash and won't work on an iPad, iPod, or iPhone). I'm a fan of Belgian chocolates, but I'm generally happy with Cote d'Or or Léonidas. Since I left the country 25 years ago, the level of sophistication in chocolate-making has definitely grown exponentially! Pierre Marcolini chocolates are not big, but they are packed with flavour, with no guilt attached, they are so small. I can honestly say that every single one I've tried (and we're now on the 2nd layer) has been delicious, with unusual flavours (like ginger, saffron, earl grey tea, violet) and textures (crunchy Quimper lace biscuit) and even colours (ruby red heart). Looking forward to my next trip to Belgium already! PS: I couldn't give you my own photo as my box is half empty. Beautiful tulips that Ted and Lucinda gave me. Brendan took these pictures so I can paint them to my heart's content. Very windy on the South Wall on Saturday - it was a struggle walking against the wind on the way back. We got plenty of fresh air, that's for sure. We saw the Jonathan Swift high speed boat sailing from Dublin port. I thought it was out of service for the winter. But now that I think of it, it's the Dun Laoghaire high speed sailing, the HSS, that's been cancelled until spring. Something all women should know: Women's Heart Attack Signs. Lovely sunny morning today, and not half as windy as yesterday. Perfect day for a walk on Killiney beach, from where we saw the dolphins in the bay. After our walk, we popped in to Avoca Handweavers in Kilmacanogue, for a quick potter and a cup of coffee/green tea and cake. Lovely shopping experience (we didn't buy anything, but I know where I'll go for kitchen accessories for Brendan's next birthday). Brendan took this unusual self-portrait photograph - and I'm in it too! Strange but true: Google Flu Trends. Don't know why UK and Ireland are not in. I did it! I survived my first Wagner opera! More than survived.Actually enjoyed it. And it didn't feel like 6 hours! 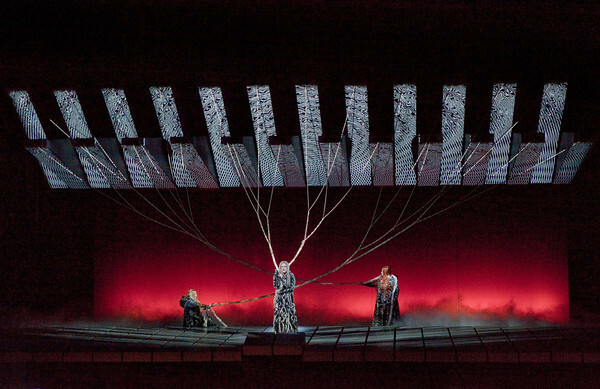 Gotterdammerung is the last opera in the Ring cycle. I had skipped the other 3 in the Met HD productions, but then decided to give this one a try. Now I'm sorry I didn't see the other operas, as this Met production is beautiful. 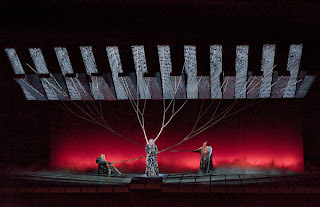 I think it's a tradition of sorts for Ring Cycle productions to be quite abstract, isn't it? Well, this one certainly meets the criteria, using a huge machinery to create the various settings - a rock surrounded by fire, the Rhine, a castle, the woods, you name it, the moving bars will represent it, with projections to match the mood. The story was a lot simpler than I had expected. Brunnhilde loves Siegfried and Siegfried loves Brunnhilde. 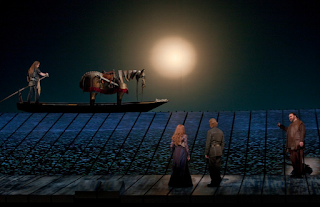 But Siegfried is given a love potion and falls in love with Gutrune, then brings Brunnhilde to marry Gunther. Brunnhilde is furious and wants revenge. Siegfried is killed by Hagen. 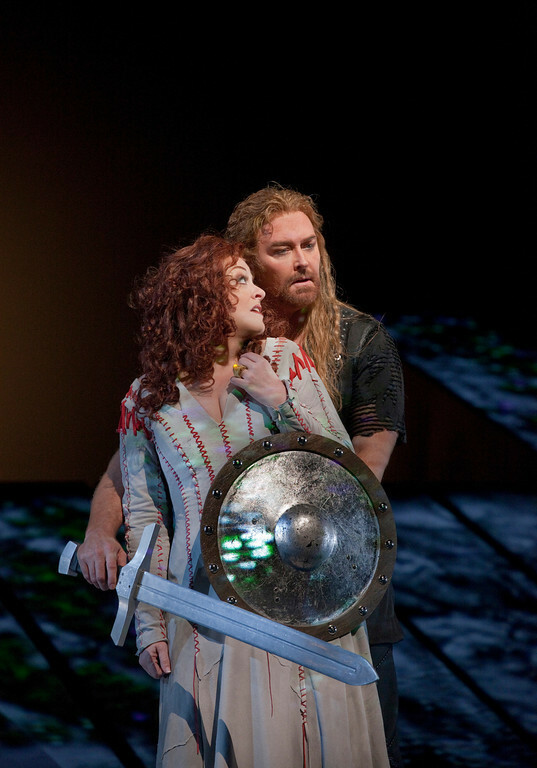 Brunnhilde finds out about Hagen's machinations to obtain the Ring and about the love potion. She jumps into Siegfried's funereal pyre with the ring and restores balance to the world. Over 4 hours or so (6 hours with intermissions and interviews). The music was beautiful, and as I'm now discovering, full of leitmotifs, repeating musical themes that represent the various characters (the well know tututuuduuu tututuuduuu of the Valkyries, for instance), locations (the Rhine), objects (sword) and elements (fire). Apparently, the leitmotifs tell the story through the music, without the need for singing even. I would have to listen to it all again to really get that, though (I have the CD set, so no excuse). But if you're in the humour, take the leitmotif quiz from the Met Ring Cycle website. Apparently, my leitmotif is Valhalla! The website is fabulous, by the way - making full use of all available media to get you into the opera - behind-the-scenes videos, information about the various characters, their relationships to others, their leitmotifs. I haven't finished exploring it yet! I should have gone through it before going to the opera! And I haven't even told you about the singers - DeborahVoigt and Jay Hunter Morris. I'll be back soon! Lovely dress and nice new hair style - Siobhan Ryan is looking good! The dress is not fuschia, really, but it's not purple, it's not magenta either. 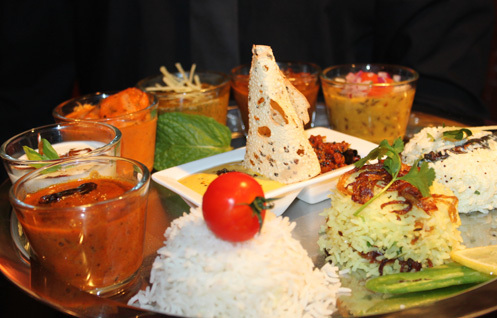 We discovered the Indian Brasserie through City Deal/Groupon vouchers. We had heard about it over time, but didn't try it until last year. We've been back a few times since. We now split our time between Indian Summer in Stillorgan and Indian Brasserie in Rathfarnham. Indian Summer is better for atmosphere and decor, but I have to say that I love the flavours of Indian Brasserie - their lamb dishes are particularly delicious. I had the lamb Koh-E-Awadh last week, very mild, but tasty. Brendan had the Aad Chettinadu, another lamb main course, with 12 different spices. We shared a Gulab Jamun for dessert - lots of calories, I'd say, but very satisfying. I'll have to watch what I eat for the next while, as I've been eating too much lately. Once I start, it's hard to restrain myself - I couldn't resist the poppadoms and the naan bread! Ted and Lucinda gave me a lovely bouquet of tulips on Friday. Really dark red, intense. I couldn't wait to start drawing and painting on Saturday. I spent a good bit of the afternoon playing with the shapes and colours. 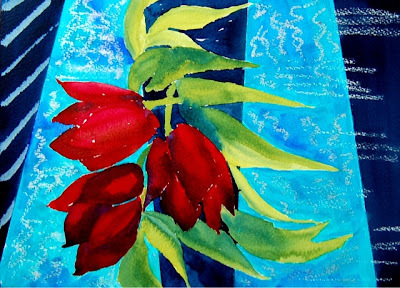 I started with the flowers, using madder red dark, brown madder and ultramarine. Once the petals were dry enough, I painted the leaves in cobalt blue and aureolin yellow. The result was lovely, but on a stark white page, not enough of a painting. I decided to experiment with Shirley Trevena's texture and colour advice, applying masking tape to create sharp delineation. The textures were done with wax, oil pastels and squidgy. I went for bold colours - dark darks with Indigo and Prussian blue, electric blue with cobalt turquoise and cobalt blue. The result is a bit mad, I admit. It looks like a vase of tulips at a window looking down over an Olympic pool. Hence the title! I do like it, but I'm not sure we'll find a place for it on our walls! Not sure yet if I'm looking forward to Gotterdammerung or dreading it! 6 hours stuck in The Screen cinema is not my idea of a good Sunday afternoon, but, then again, I'm looking forward to discovering Wagner's wonderful music. 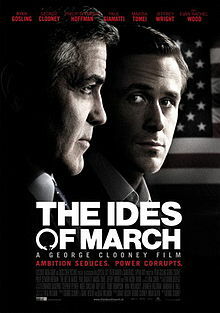 Did The Ides of March get mixed reviews? If it did, I think they are completely undeserved. It was an excellent film, delving into the manipulations and machinations of a US primary campaign. Yes, some aspects are quite predictable - the young innocent intern and the good-looking, smooth-talking presidential candidate (George Clooney) who seems too perfect to be true. The experienced campaign manager, smoking too much, living out of a suitcase, demanding loyalty from his staffers. The central character in the story, though, is one of the top campaign aides, a yound idealistic man, whose illusions are shattered when he finds himself at the centre of a game played by the senior campaign managers on both sides. His "coming of age", so to speak, is what made The Ides of March interesting to me. What will he do? Will he quietly leave the world of politics, where his innocence cannot survive? Or will he become better at the game than the best of them, in the process betraying his own ideals? I love it when George Clooney makes political thrillers! Et Tu, Brute! We decided to treat ourselves to breakfast in Bewley's on Grafton Street yesterday. It was years since I was there. Brendan had the full Irish and I, pancakes with nutella and banana. Lovely. Service was good. But I don't think you could linger there for hours like you could in the old days, reading a paper and watching people come and go. The banquette seats kind of block the view, so you can only see a small portion of the room. And they seat 2+2 in the banquettes, so you can't have a lovely big table to yourself any more - We had a table for 2, which was fine, but we saw a couple at a banquette finding themselves with a lady seated just beside them - it was too close for comfort, and they quickly finished their tea and left. A good way to start the day. A pity it was so cold in town yesterday, though. I was wearing a warm jacket, but the wind chilled me to the bone. However, with temperatures reaching 11 today, I really can't complain. The rest of Europe is still stuck in sub-zero Siberian air, after all! Of the last three days, this one is my favourite outfit. I much prefer this top than the previous day's satin number. It's younger and suits Siobhan better. Catching up on Siobhan Ryan's latest outfits - she's feeling summery, despite the cold weather. Not the most flattering top, but, still, a lot prettier than Jean Byrne's short-sleeved black top. I had a dream about being at school, standing at the blackboard, last night. I was trying to resolve a puzzling equation. Now, we didn't do equations when I was at primary school, but my dream was definitely set in my old primary school, Heuvy, not the Lycée. That's the thing about dreams, they don't have to be logical. Normally, my anxiety dreams are set around reading Latin, or Russian, or struggling with taking notes in College. I was good at maths, so never really had any major anxiety about it. But then again, I was good at Latin, and Russian. 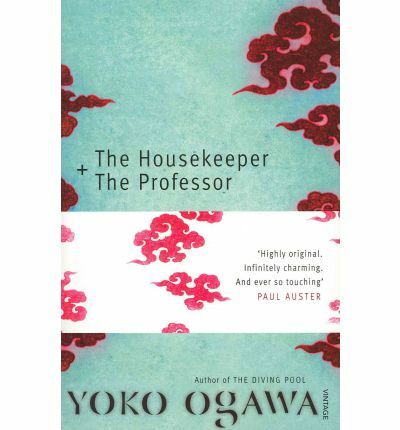 The key to this dream, I think, is that I had just finished reading The Housekeeper + The Professor, by Yoko Ogawa, the story of a housekeeper, her 10-year-old son and the mathematics professor she works for. The professor was in a car accident in 1975 and suffered head injuries. He remembers everything before that time, but his short-term memory resets every 80 minutes. His mathematical mind is intact, however, and he opens the world of numbers for the housekeeper and her son. In a strange way, they become closer than family. Not a big fancy book, but a lovely story. The only thing I found strange is what this Japanese housekeeper cooks for this Japanese professor - she bakes bread, she prepares shrimp cocktail, and cooks roast beef and mash!! I don't get it? Maybe the translator thought that the English reader would find the Japanese dishes too exotic. But, surely, an English Sunday dinner is an adaptation too far. PS: I was talking about not reading as much as I used to - this blogger certainly does a lot of reading! I must have a look through her list when I run out of books to read - at my current rate, that's probably in a year's time at the earliest! I've got Zazzle on my mind today. I painted a watercolour just so I can use it as a design for a folio planner in Zazzle! You see, you can't use any old painting for Zazzle - you have to design for its use (different design for a mug than for a laptop sleeve or shoes - oh they don't do the shoes anymore. I have a beautiful pair of keds with my own design of cherry-blossom. I'm so glad I got them.) and its shape and dimensions. It has to work as a product, not just a flat painting. I had an idea of windows on a warm Mediterranean-coloured wall. I did a couple of drawings to develop this simple concept, measured my paper to match the dimensions and proportions of the folio planner, applied wax and oil pastel resist, and finally, painted bright sunny colours. It will shortly be available on Zazzle! I can't wait to see it. 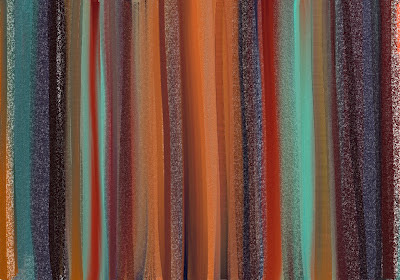 I find the iPad is a great tool for doodling - though I spend more time looking at sheep-herding rabbit videos than actually creating original art. That's the problem with Facebook, Flipboard and all those sites - we all end up reading and watching bits and pieces that are of minor interest, rather than finishing a good book. Has anyone looked at statistics of how long it takes the average person to read a book nowadays? I just know that I'll go through my Facebook and Flipboard tidbits before I pick up my book at the end of the evening. I love my Flipboard, where I can find my customized sample of news and lifestyle articles, and I enjoy catching up with my friends and family on Facebook (though some of my best friends are still resisting the lure of social networking!). But an hour has gone by, and it's time to go to sleep. And the beautiful book I'm reading at the moment, The Housekeeper + The Professor, will have to wait another day! But last night, I did use my iPad for creative purposes. 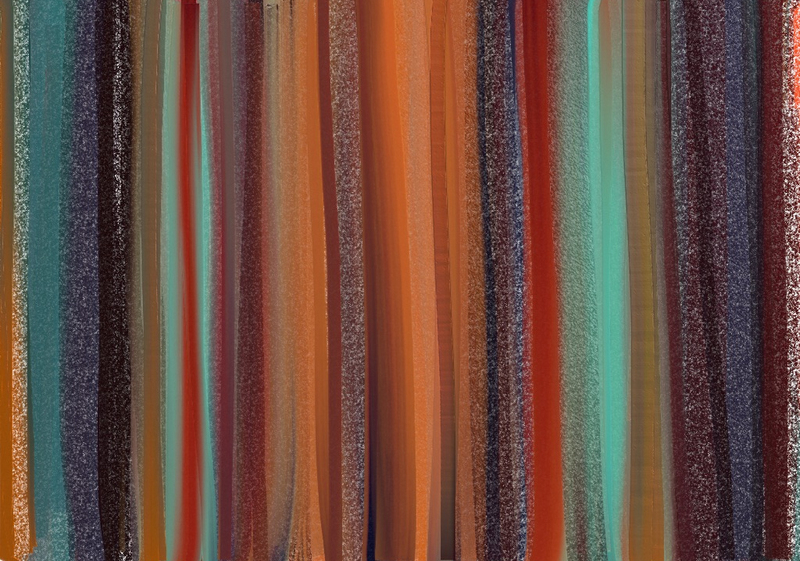 ArtRage is a good app for trying things out. I had in my mind some colours I wanted to experiment with for a Zazzle project. Painting it with ArtRage was the easy bit, actually. I spent a good bit of time after that figuring out a way to make my painting larger to I can use it for a design in Zazzle, without losing in resolution. I haven't found the perfect solution yet, but I got a workaround that will work for the current project. But now that I've found you can design napkins, kitchen towels and even pillows in Zazzle, I'm going to have to design in a much larger size. I don't think that's going to work with an iPad, unless the iPad 3 enables me to work at a higher resolution! On my todo list next time we're in Japan: Cat Café, Tokyo. Here is one more of the Yellowstone series - Prismatic Pool. You can't but love the colours of the Grand Prismatic Spring - turquoises, oranges, dark and vibrant, shimmering, pulsating. It took me a couple of attempts to achieve the effect I wanted. I used indigo, phthalo green and cobalt turquoise for the water, with cling film spread over to break the surface. 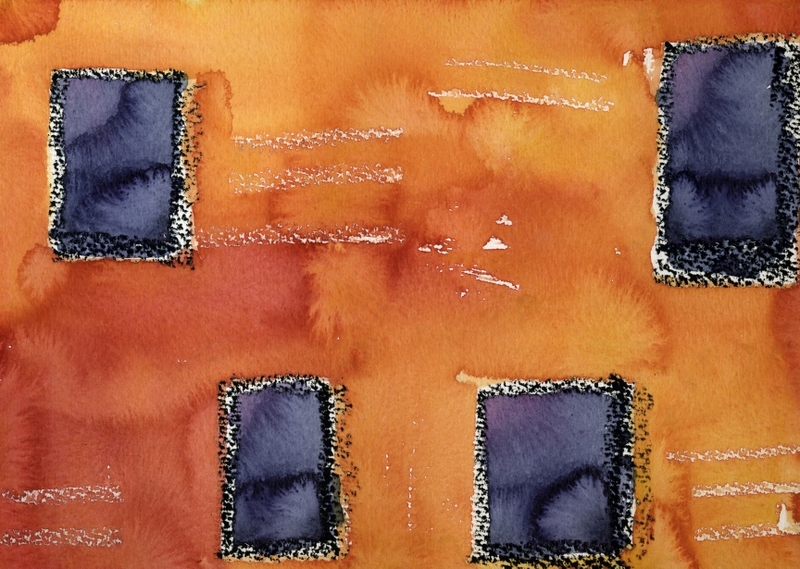 The orange is made of a thick mix of vanadium yellow, ruby red and a touch of ultramarine blue. And sepia is the perfect dark dark brown. I dotted the surface with iridescent oil pastel (rich gold, golden pearl and red copper) before applying the watercolour. I'm happy with the colours and textures, but the shapes and composition aren't quite right. It looks more like a scene from Star Trek, with solar flares hitting the earth and distorting its surface. The ultimate test is whether I'm prepared to pay €50 to have it framed. The jury's still out on that one. 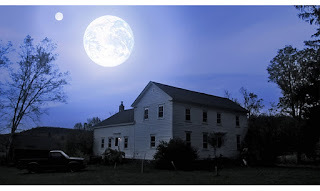 Very unusual movie, Another Earth. Apart from the fact that there is another Earth in the sky, it's not science fiction at all. A young woman with a promising future is driving home after a party. It is announced on the radio that a new planet has just appeared in the sky, another Earth. It looks identical to our home planet. Does it carry life? How can we contact its inhabitants? As the woman looks up at the sky, fascinated by this new body in our sky, she swerves, and crashes into another car, killing some of its passengers. When she gets out of jail a few years later, her life is very different from what it would have been if not for the accident. What follows is a story of loss, despair, atonement, and hope.